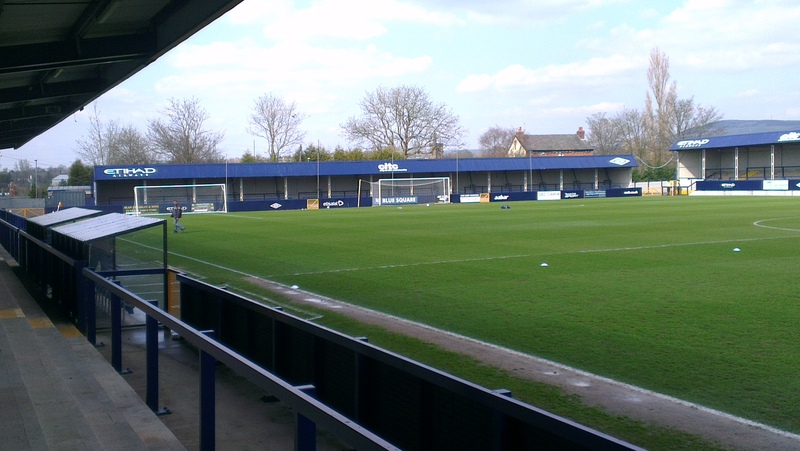 Hyde's Ewen Fields is a unique ground in the sense that they advertise another football club, with very few references to themselves, it really is quite strange. Going into the final game of the 2012/13 season against Hyde, the Imps had a slight chance of being relegated to the Conference North, although fixtures elsewhere meant that it was a VERY slim chance indeed. Many Imps made the trip to just outside of Manchester, and out of a crowd of 1,300 or so, 977 were Lincoln City fans, it was truly an Imps invasion of another team's ground, outnumbering the home fans at around 3 to 1. Getting to Hyde is generally easy. I had stayed in Leeds overnight and from there the train journey was simple, with one change at Manchester Piccadilly, however, following directions to the ground are somewhat tricky and even using maps on my phone, it wasn't exactly easy finding the ground as it is quite small in terms of height. Specially around the ground there isn't really a lot to do at all, unless of course you have a membership for their local sports centre, which is located directly outside of the away end....that is once you have found the away end. There are no signs anywhere at the ground that point you to the away end, so you have to either ask one of the few stewards that are dotted around, or take a wild guess. A few minutes walk from the ground there are a few pubs, but I only went in one of those because I needed to charge my phone. The pub "The Sportsman" also got in a hefty amount of trouble due to serving alcohol to 15 year olds without asking for ID.....with the cops standing right next to them. Other than that, as I say there is precisely nothing to do around the ground, which is a shame in many ways as you on a day where you could potentially get relegated, you would like to be able to take your mind off of things. Once we eventually got into the ground, after having to wait for two sets of gates to open (and at different times), we were greeted by a very strange ground indeed, and it's not strange because of the stands, but rather the fact that there is advertising for Manchester City everywhere. Don't get me wrong, I appreciate that Manchester City saved their football club and that is something that would probably not happen anywhere else, but they made some ridiculous demands in return. 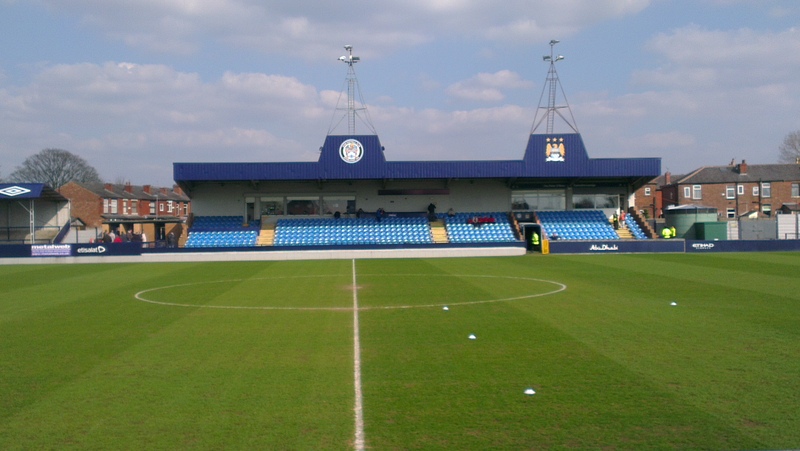 Hyde played in red before hand and had a red ground, now they play in blue and have a ground of the same colour.....and Manchester City's badge, sponsors and website address are listed everywhere. Infact, in the entire ground there only appears to be a single reference to Hyde anywhere, and that is their badge being placed onto the roof of the main stand. The away end for this game was actually two stands. The first was the one that the fans entered and it was a pitch length terrace. This offered a half decent view of the action, that despite that lack of height in the stand, with there only being about 6 or so steps to the terrace. Going clockwise around the ground and you got to the other stand that was allocated to the away fans, a terrace behind a goal that looked very small, however, not as small as the next stand, a very small terrace that took up the length of about 1/4 of the pitch. Despite being small and probably not offering a good view, this stand was strangely the most popular amongst the Hyde fans, with the majority of their support of just over 300 going in here. Another small stand was next to that. This seated stand took up about 1/4 of the pitch as well and is not too dissimilar to terms of size to the Family Stand at Sincil Bank. 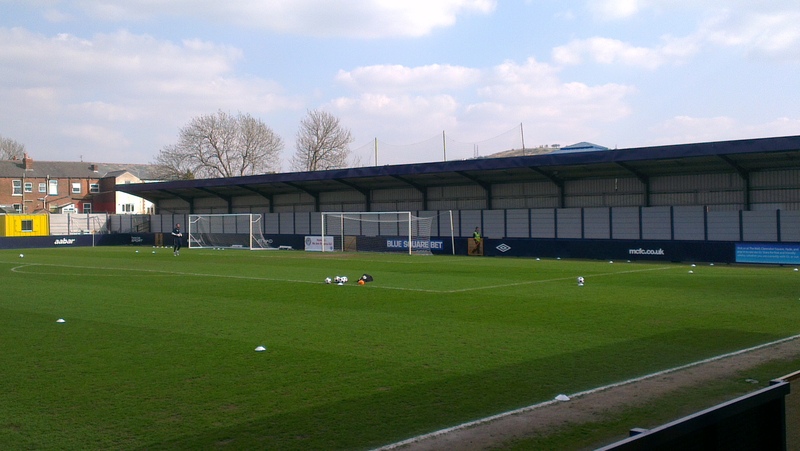 This stand, despite being a stand for home supporters, did contain several Lincoln fans ahead of the game. The final stand at the ground is a small terrace with a massive wall after only 2/3 steps. This stand was not in use for the game, and I wouldn't be surprised if it is never open. The atmosphere at Hyde was non-existent, which was a bit strange as the club had made a big song and dance about surviving their first year in the Conference before kick off. Maybe it was because we won 5-1, maybe it was because we outnumbered them nearly 3 to 1, or maybe they just don't sing at all normally, either way, they were silent. 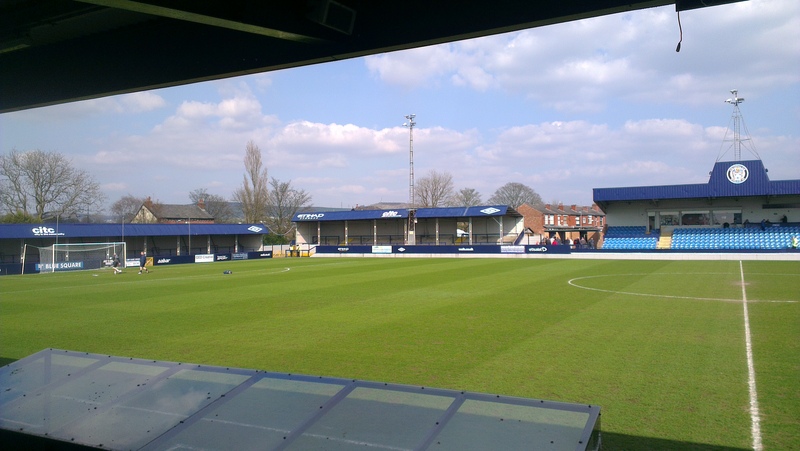 I must admit that Ewen Fields isn't one of my favourite grounds and despite the fact that (at the time of writing) I live relatively close to the ground, I more than likely won't go to this ground other than when Lincoln are playing.